At Longhorn Cavern State Park in Burnet County, folks are still searching for Sam Bass’ gold. Sam Bass was a Texas outlaw who died in 1877 in Round Rock, Texas at a fairly young age. He was shot trying to rob a Round Rock bank. Legend has it that that Sam Bass used Longhorn Cavern as a hideout and that he left stolen money there. Some of the rumors circulating at the time had his ill-gotten gain totaling upwards of two million dollars’ worth of gold. No one knows for certain if Sam Bass hid that much gold in Longhorn Caverns, or hid any gold—or even visited the cavern, for that matter. The real treasure is its geology and history. Geologically, it has formations known as calcite channels, crystals, columns and draperies. Historically: Confederates used the cavern during the Civil War to make gun powder from bat guano. In the 1920s, during prohibition, Burnet County residents used the cave as a speakeasy; they installed a wooden dance floor where residents danced to live bands. In addition to cavern tours, check out the calendar section of the TPW website for events planned inside the cavern. That’s our show for today…Brought to you in part by RAM Trucks. Built to Serve. Mission Espiritu Santo de Zuniga, part of Goliad State Park & Historic Site, was established in 1749 by Franciscan priests. Next week the TPW TV Series on PBS takes you there to experience an annual event called “The Illumination”. Assistant Superintendent Jason Ramirez. In a lot of the Franciscan missions there is a documented event that will usually coincide with a solar event; a lot of the times it’s one of the holy days of the Catholics. 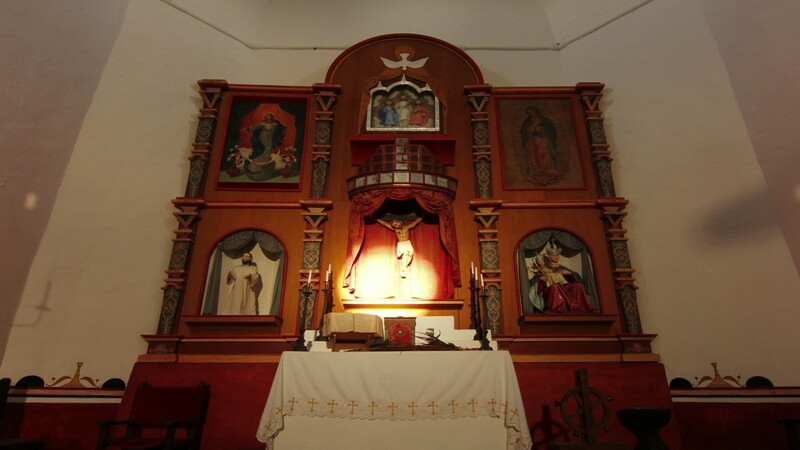 In our mission we have something that happens every year on April 16th; we don’t really have an official explanation for it, but basically what happens is the sun will set in the ‘window of the sun’ as we call it, and cast a direct beam of light onto the Crucifix here. It happens every year on April 16th at around 7:00pm. One of the things we do know is that April 16th is an important holy day for Franciscans. It’s the anniversary of the founding of the Franciscan Order, and so it’s a very important day for the Franciscans. It’s a day that they renew their vows and rededicate themselves to the faith. And so we think that this may have been something that the missionaries here planned to convert the native people here, also to celebrate their faith. Witness “The Illumination” next week on the Texas Parks and Wildlife TV series on PBS. El Camino Real de Los Tejas, is a historic trail from Spanish Colonial times that shaped Texas history. Learn more on a segment of the Texas Parks and Wildlife TV series on PBS. I’m Steven Gonzales. 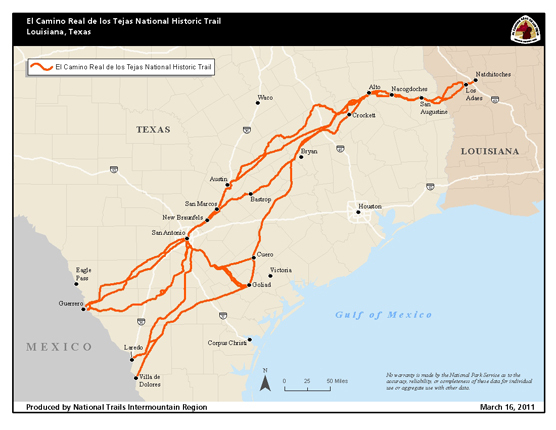 I’m executive director of El Camino Real de los Tejas National Historic Trail Association. El Camino Real de los Tejas is the old royal road that came up from Mexico City to establish Texas in Spanish colonial times. It’s the road that led to the founding of Texas. There are many caminos reales that make up the Camino Real. In times past these roads have different names because of the places that they were going to. The Old San Antonio Road and the Nacogdoches Road, La Bahia Road and the Laredo Road. Every Texan of note that we can think of, all the way from Spaniards such as Alonzo de Leon to Davy Crockett, Jim Bowie, Sam Houston, they all travelled along portions of the Camino Real at one time or another, and it’s really elemental to the state’s history. We think about things like the battle of the Alamo and Goliad, and we forget that those troops were actually travelling along roadways, pathways, and those were largely the Camino Real and segments of it. So one of our goals is to make the public more aware of it. El Camino Real de los Tejas: Tracing a Timeless Trail next week on the Texas Parks and Wildlife TV series on PBS. Check your local listings. LBJ and Lady Bird enjoying the wildflowers in his beloved Texas Hill Country. Even though Lyndon Baines Johnson spent many memorable years in Washington DC, the Texas Hill Country held a special place in his heart. Here is where I would always return, to the Pedernales River, the scenes of my childhood. There’s something different about this country, from any other part of the nation. LBJ often credited these pristine surroundings of his youth as a major influence in his life and presidency. And it is where he returned when he left the White House. I guess every person feels a part of the place where they were born, he wants to go back to the surroundings that he knew as a child and this is my country, the Hill Country of Texas. The LBJ State Park and Historic Site, located near Johnson City, gives visitors a chance to experience the land which President Johnson held dear. There’s something about this section that brings new life and new hope and really a balanced and better view point after you have been here a few days. Learn more about the LBJ State Historic Site, log on to the Texas Parks and Wildlife website. For Texas Parks and Wildlife… I’m Cecilia Nasti. The Battle of San Jacinto was a game changer in Texas History. On April 21, 1836, an untrained Texian militia routed General Santa Ana’s troops. The actual battle lasted less than half an hour; it carried on into the evening with clean up. But the main assault and the main fighting was done in less than half an hour. Justin Rhodes is Region Four Director for State Parks, which includes the San Jacinto Battlegrounds in LaPorte. On Saturday, April 22th, the historic site celebrates this momentous battle with a reenactment and festival. If you’re planning on coming out, I would recommend you arrive early when the crowds are low. That will give you plenty of time to visit the festival and get set up for the reenactment. The reenactment will occur only once during the day. And that happens around 3 p.m. Rhodes hopes visitors leave with renewed appreciation for the sacrifices made on the battlefield in 1836. Ultimately we want visitors to take away an appreciation of the significance of the site, the event, the history tht brought us to where we are today. So much of what we do today and tomorrow is based on lessons from the past – from the sacrifices that these men and women brought forward. They teach us valuable life lessons moving into the future. The festival runs from 10 a.m. to 6 p.m. The reenactment is at 3 p.m. details at texasstateparks.org. That’s our show for today…For Texas Parks and Wildlife…I’m Cecilia Nasti. You are currently browsing the archives for the Historic Sites category.